You are here: Home / Rural Women's Stories / A real-life nightmare! My life hasn’t been all that eventful lately unless you want to talk about the rehab center, and that’s over. I lived through it. She was in a rehabilitation facility after an ankle wound skin graft. Some days I wondered if I would get out of there. After the first four or five days – I was ready to go to another center, I called them and everything. The driver was just taking me to the main hospital so they could change the ankle bandage and make sure the wound vac was working correctly. I didn’t know he wouldn’t get paid if he didn’t take me back to the rehab center. So, I went back. I stuck it out for three weeks until my sister came and rescued me. She brought me avocados and little crackers, and prunes. I made room in a drawer for what she brought me because the food in the center was – I couldn’t eat it. They lied to me about having a vegetarian diet choice. The cook’s idea of a vegetarian lunch was a greasy, salty grilled cheese sandwich that fell apart if I just picked up the corner with my fork. Sometimes they would bring me scrambled eggs for lunch with so much salt I couldn’t eat it. I lost eight pounds, and I didn’t have eight pounds to lose. That is an understatement. 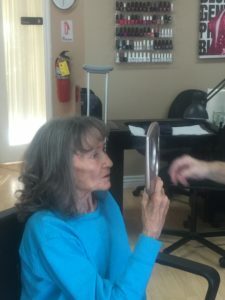 They kept trying to give me physical therapy even though I wasn’t allowed to have physical therapy because I had to keep my foot elevated – never to be down. I couldn’t even get out of bed to use the bathroom. They bugged me and bugged me to do what the doctors said not to do, and called me unreasonable and irresponsible. It was awful. Thank God for the TV, and the cool young people who were the nurse’s aides; they would come in and try to cheer me up. They wouldn’t leave the room until I had swallowed them all. When they had me in diapers, it would take 45 minutes or an hour for someone to help me. It was hell’s rehab! It was a real-life nightmare! I was suppose to have two nebulizer treatments a day, and in three weeks, they gave me three total. They sent me home with the rest of the caplets so I could do it myself. The center I was in was like a horror chamber. I’m just so glad it’s over, and I lived to talk about it with a positive attitude that it will never happen again! Just getting rid of the memories is cathartic, and clearly necessary to not be afraid. The kids that work there are overworked and thank God they won’t be there their whole lives. They are just teenagers. I learned so much, and I just try to look at the positive. I’ve experienced the very worse. I didn’t have the choice to choose. The clinic staff just did it. I learned to do more research before I get talked into anything. My Doctor had no idea what a terrible place it was. There are so many rehab centers anymore, and many are owed by the same creepy people. I told my sister Vicky I had to get out of there or go crazy. They would not let me talk to her or my older sister. They wouldn’t give any information on how I was doing. I was a prisoner. So she came and took me away. It took forty-five minutes to an hour to check me out, but I was sitting right there in my wheelchair as they did all the paperwork. A traumatic experience in a rehab center told by a country girl who values her independence and is accustomed to making decisions for herself. So so sorry for what Zella had to experience! Unbelievable! Not meaning I don’t believe her, but unbelievably bad. No one should go into a hospital or a rehab facility without a strong advocate. FYI, your doctor at the hospital or your primary doctor is not your doctor at the rehab. Take your cell phone and call your own doctor. So sorry! Facility needs to be reported to the state! It really was sad. She was traumatized. I was in CO, and she did not have a family advocate.I agree about needing to report. I think she did submit an evaluation form, but you know how that is:( She does have a cell phone, but she can’t figure out how to use it. I think many elderly are in that situation. I help her with it, but I think she is half afraid of it;) It is a difficult situation all the way around. Thanks for the thoughts! Jennifer this story makes me so sad. No one deserves that sort of treatment! She needs to come visit The Harmony Home sometime! I would never allow that behavior. Thanks for sharing! Kendall, I wish she could be in your beautiful Harmony Home too. What a peaceful change that would be for all of us! Hi, Julie. Yes, sad story, but not unique. Thank you for your care and concern. I’m not surprised but very sorry that these places are still around. Places like that are chamber’s of horror and I’m so saddened to hear about Zella having to endure that treatment. I don’t know why trying to live has to be such a battle for the elderly??? I know, Kathie, and we are right there…so, I hope stories such as Zella’s help us all look forward and get in place people who can advocate for us, as well as each of us being more vocal for ourselves and not just nice, kind, sweet, and wonderful as we were trained as children. Thanks for your comments! My father, Zella’s Uncle is in a permanent care facility and if it weren’t for his incredible roommate, I fear my dad’s care would be a lot worst. Mom was so diligent and the staff knew not to cross her. With her gone, my sister has been left with the near daily task of visits and care but his roommate informs us of all infractions, or concerns. It sickens me to think my own cousin went through this but glad she is okay now. I pray she stays well enough to never have to go back into any care facility again. HI Lynda…it is all just wrong. I’m so sorry Uncle Roy is experiencing infractions! So grateful, as I know you are too, that Brenda is there to be his advocate. It is just tough no matter how we view it. Thanks for you comments! Sad! They “delivered” my sister from the hospital to rehab in Denver area. She said when the van pulled up it looked like a 70’s motel! She told the driver to just take her home. He said he was only authorized to bring her there! She said after 3 days she had her “people” there to advocate for her. Hi Mary…So good your sister has advocates. My sister said they wouldn’t let her call anyone, and she doesn’t have a cell phone. It was a really sad story. You and I are lucky to live in one story homes with “advocates” at every turn. Thanks for the comments!